An original 8x10 photo of Bob taken in 1930, a Louise photograph (pre-Hurrell!) with his autograph...what's not to like! You can even tell he has blue eyes, the iris in the right eye is definitely on the light side, something not caught by most of his photos. What made this photo even more of a treasure for me is what I discovered on the back, a list of Bob's movies starting with Three Live Ghosts (1929) through Ever Since Eve (1937). 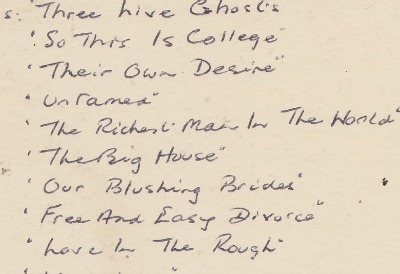 The consistency of the handwriting indicates it was written in 1937 or after (my handwriting certainly changed over any 17-year period). The earlier movies are slightly out of order, but close. 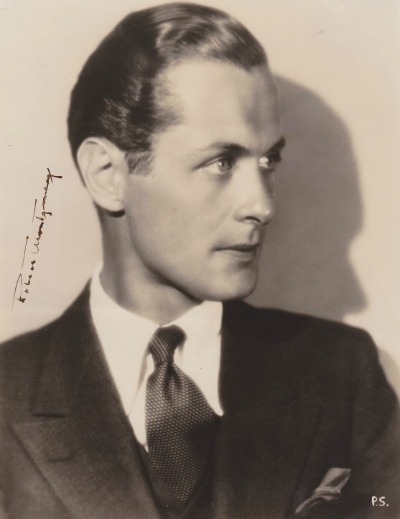 Interestingly, three of his movies are listed using the working titles: The Richest Man in the World for Sins of the Children (1930), The Girl I Made for Made on Broadway (1933) and The Suicide Club for Trouble for Two (1936). And two movies have been combined as Free and Easy Divorce ...makes a great title! Wonder why the list was made after all those years. Did the photo change hands and the new owner made the list? Or was the original owner testing her/his memory? And why the use of working titles? I am puzzled. As I usually am about so much of Mr. Montgomery. What's the saying; "The more I know, the more I realize how little I know." Yep, that's me. Via CM staff blogger Debbie. A big thanks to Debbie for helping keep us going! 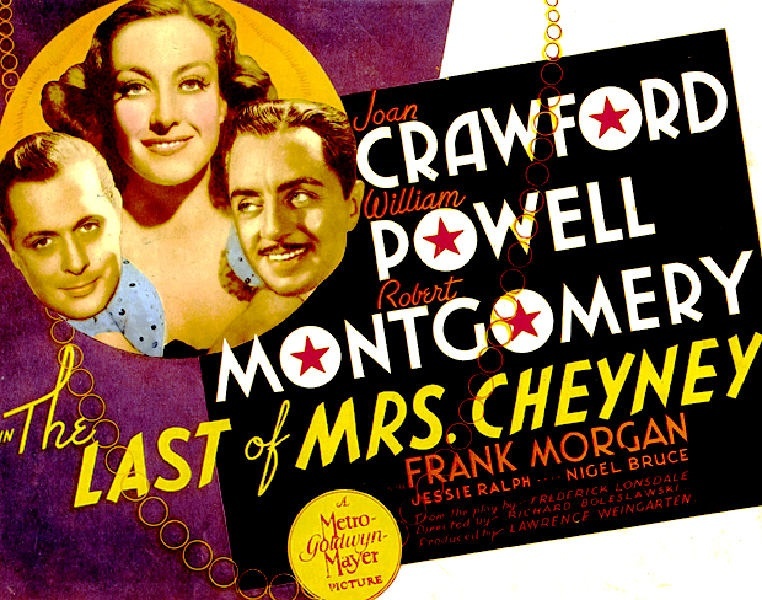 The Last of Mrs. Cheyney was based on the play of the same name by Frederick Lonsdale. The film was produced three times, once in 1929 starring Norma Shearer and Basil Rathbone and in 1951 as The Law and the Lady with Greer Garson and Michael Wilding. The second production is my subject for today. The Last of Mrs. Cheyney filmed in 1937, starred Joan Crawford and my two favorite actors, Robert Montgomery and William Powell. This production involves a group of British aristocracy and a group of jewel thieves. The aristocratic group includes Robert Montgomery, the wonderful Frank Morgan, Jessie Ralph, Nigel Bruce, Benita Hume & Ralph Forbes. 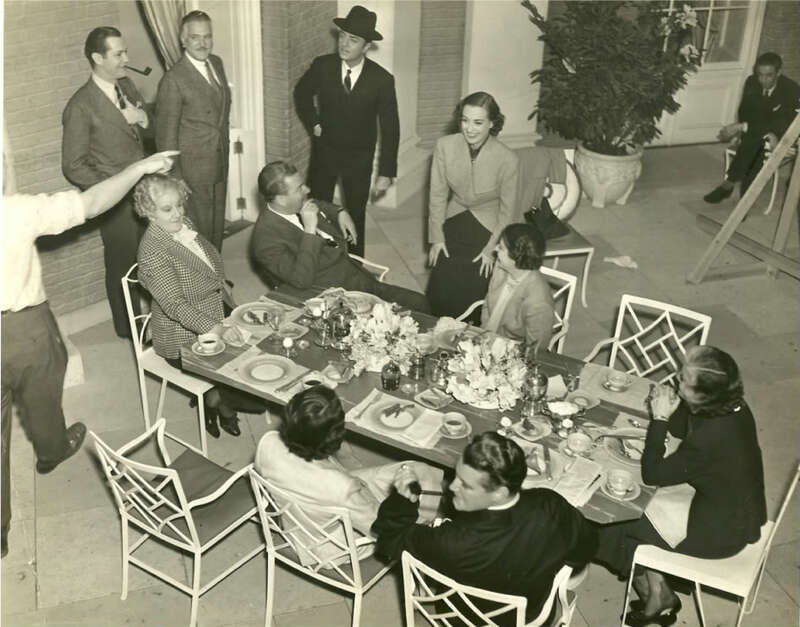 The thieves are played by Joan Crawford, William Powell, Melville Cooper, Leonard Carey and Sara Hadden. Joan Crawford poses as a wealthy widow in order to infiltrate the group of true aristocrats and steal a pearl necklace. William Powell poses as her butler, but in fact is the leader of the group of thieves. 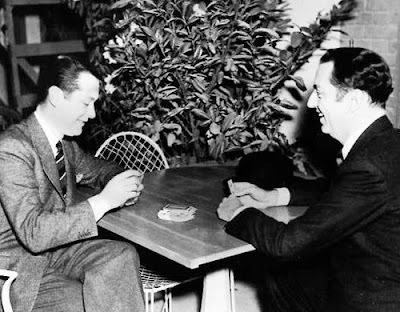 Bob Montgomery and Bill Powell amusing themselves between takes. 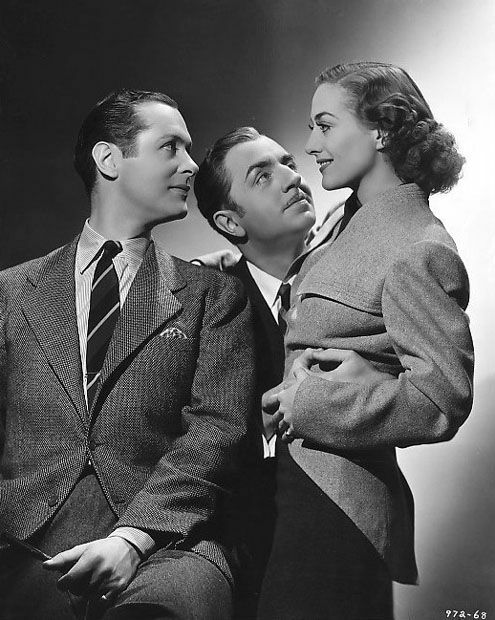 Crawford’s character, Fay Cheyney, is pursued by two of the titled men, Lord Arthur Dilling (Robert Montgomery) and Lord Francis Kelton (Frank Morgan). Both men have fallen in love with her and both propose to her. She starts to rethink the theft when she realizes the life she could have with either of her suitors. Charles (William Powell) is also in love with her and is willing to let her abort the plan to steal the necklace to allow her the chance of a better life. It’s a fun movie with a wonderful cast. Just being able to see my two favorite actors in the same film was reason enough for me to watch it, but the whole ensemble cast is a joy. TCM will be showing this film on June 8th. Catch it if you can. You won’t be disappointed! It's not that I almost forgot Bob's birthday, more correctly I barely realize what month it is. Nine weeks of waiting for our house to be repaired (after it flooded out due to a plumbing failure) is not something I would wish on my worst enemy. Repairs are finally complete and now we get to put everything back in order. Our house is really a media center, more DVDs, DVRs, VHS tapes, CDs and books than more rational people can imagine. And nothing is in order ... sigh. Promise this will be the last time I bring this up, but must share one more thing about it all. The morning of our flooding, after calling for help and being told the cleaning/restoration guys would be at the house within the hour, we started grabbing items for our exile. While my husband pulled out suitcases and starting packing clothes, etc., I grabbed some storage boxes and began packing up my Bob items to be taken to higher ground. I mean, there are priorities in life. A few words from guest poster Debbie on one of her favs! This Sunday, May 15th, at 8:00 am, TCM is showing one of my favorite films of all time. Its 1936’s Libeled Lady, directed by Jack Conway and starring William Powell, Myrna Loy, Jean Harlow and Spencer Tracy. Talk about your terrific casts! This is almost a perfect screwball comedy in my opinion. It has a great plot. 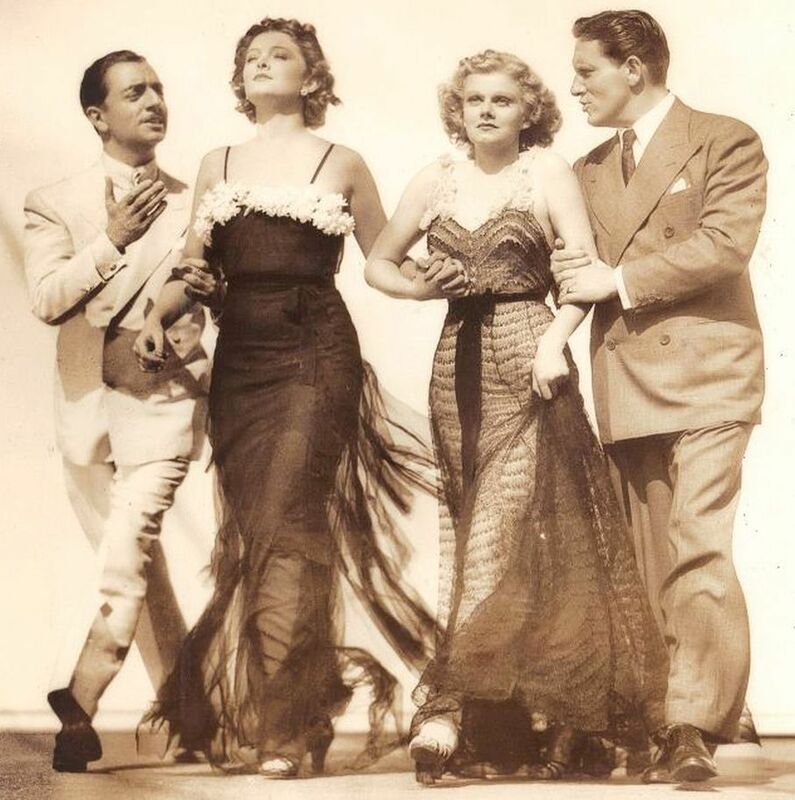 At the time this was made, William Powell and Jean Harlow were a couple in real life. 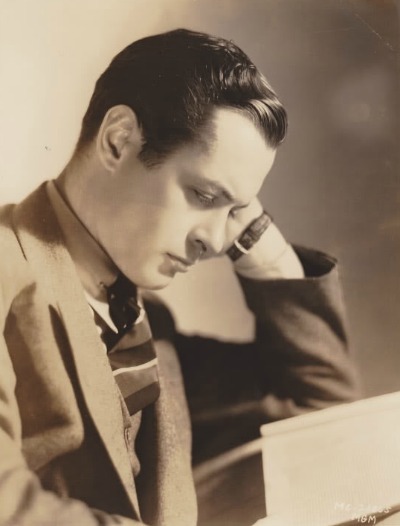 Harlow wanted badly to play the romantic lead opposite Powell but because Powell and Myrna Loy were a greatly loved on screen couple already, Loy was cast as Powell’s love interest. 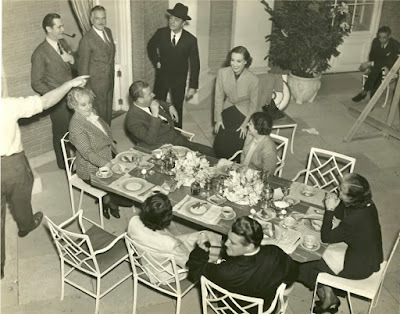 Harlow was coupled with Spencer Tracy. However, the plot involves a sham marriage between Powell and Harlow’s characters, so she at least got to marry Powell onscreen. Their real marriage would sadly never take place due to her untimely death the next year from renal failure. 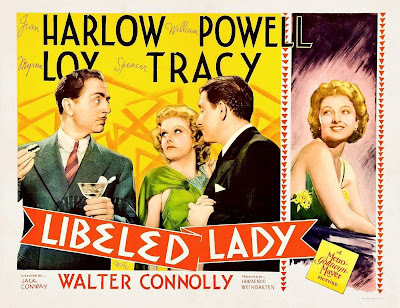 The plot is about a wealthy socialite (Loy) who is suing a newspaper for libel because of a fabricated story claiming she stole another woman’s husband. Tracy is the editor of the newspaper and Harlow is his fiancée. Powell is brought in as an expert in dealing with libel suits. He devises a plan to trick Loy into a comprising situation so that she will drop the suit. 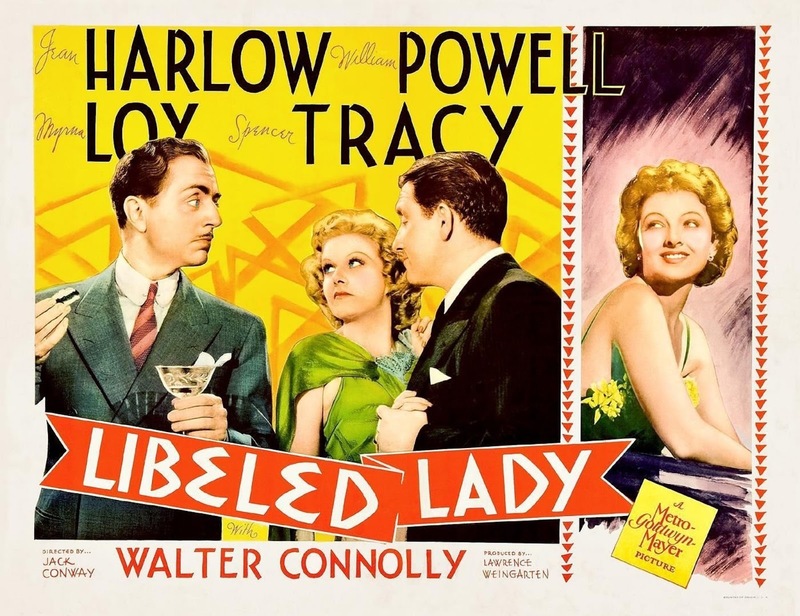 Tracy offers up a not to happy Harlow as the girl Powell will marry in order to create the set-up for Loy. This film is nothing but fun with its plot twists and romance. There is also a famous fishing scene with Powell that is laugh out loud funny. 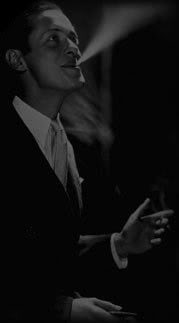 One the things I love most about Powell, being the well-dressed debonair individual that he was, was his willingness to play parts in which he is put in the position to make a fool of himself. The man could be so funny!